We have chosen Hebrew names to reflect our pride in our heritage. Malachay Ha Shalom literally means messenger of peace but is translated in the bible as Angel. Chava means life or life giver. Chava Nagila is a popular Israeli folk song about the joy of life. U-CD Gr.Ch. 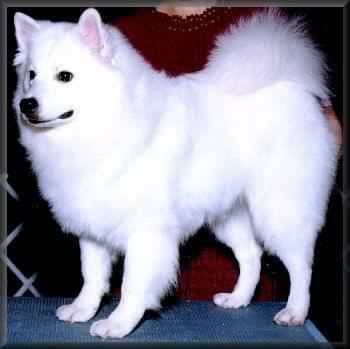 "PR" Jbar Sierra Yukon Jack Angel, a miniature American Eskimo, is a flashy performer in both the conformation and obedience rings. She is well admired for her strikingly beautiful head and black points. Angel passed her Canine Good Citizen Test in July 1998, earned her AKC Championship in November 1998, and her UKC Championship in September 1999. 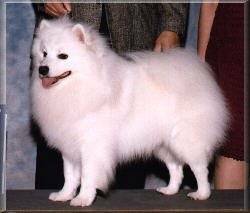 She earned her AKC Companion Dog (CD) title in July 2001 and her UKC CD in August 2001. She is now training for Agility competition. 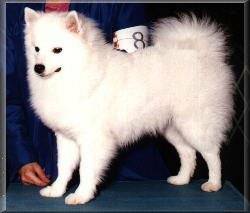 Prince, a standard American Eskimo, will endear himself to you with his personality. What a character! Standing out among his competition in the show ring, this gorgeous boy has won multiple Best of Breeds and Group placements. 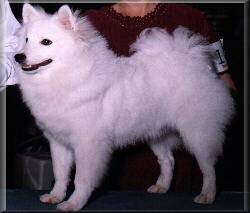 Prince ranked in the Top 20 Eskie All-Breed standings in 1999,2000,and 2001 as well as finishing 2001 as # 3 in the breed in AKC. AKC Ch./UKC Gr.Ch. Pyramids Instant Replay Cissy, a standard American Eskimo, greets everyone with her outgoing nature and super loving temperament. Her solid bone structure makes this beautiful girl a winner in the show ring. Cissy earned her UKC Championship in September 1999, her International Championship in February 2000 and her AKC Championship in November 2000. She passed her Canine Good Citizen test in November 1999. Watch for Cissy in the agility ring soon.